Although we were able to teach Leo ‘sit’, ‘down’, and other commands, he would only do them when he wanted. He would not eat on a regular schedule but instead ate only when he wanted and only in small amounts at a time. He also had some bad behaviour issues including jumping up on us. Then we started working with Olive. She was able to explain to us why Leo would not listen or eat the way he should, and she showed us exactly what to do to change his behaviour. We started seeing results immediately. Within the first day after our first private lesson with Olive, Leo’s behaviour started to change. He started eating on his own within a few minutes of his food being put down. He started following our commands. His stay, which he would previously never hold, became strong. His jumping has decreased drastically and is still decreasing. We now have control over his behaviour, which is improving every day by using Olive’s instructions. We highly recommend Olive to anyone who needs training for their dog. 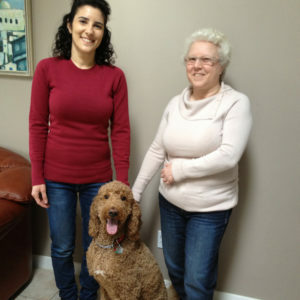 Olive cares about your dog’s well-being and will help you to understand the reasons for your dog’s current behaviour. Olive’s gentle approach will teach you how to communicate with your dog both verbally and physically, to get the best behaviour from your dog and to have the dog you’ve always wanted.